A grim and twisted rendition of the Russian Revolution and Stalin’s rise to power, George Orwell’s Animal Farm is a magnificent classic that continues to amaze readers over 50 years past its original release. Tired of taking demands from the human farmer Mr. Jones, the animals on Manor Farm fight for their freedom and for equal rights among all animals. But what happens when some take advantage over other animals? Is there such a thing as equality among all when not all seek this value? Apparently, I’m one of the FEW that never read Animal Farm during their high school years. Orwell’s novel has been on my TBR list for longer than I care to admit. Honestly, I have to start reading books that I purchase sooner. George Orwell’s novella is a masterpiece, detailing pieces of Russian history in a very peculiar way. 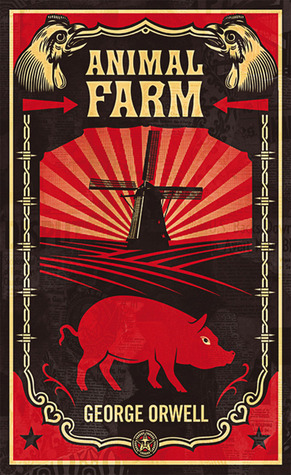 Whether you’re a history buff or simply looking for that next great read, Animal Farm will definitely not disappoint. Orwell’s fairy tale is an allegory detailing the grim and horrific events of the Stalinist era. Originally titled Animal Farm: A Fairy Story, this novella follows the story of a group of animals on a farm after they’ve taken it over from the human owner. From Manor Farm to Animal Farm, the animals preach animal equality and animals over humans. By writing a list of commandments, the animals define their “animalism” and learn to treat one another as “equals”. From here, the story takes a turn as certain animals begin to believe they hold some higher power over the others. Using intellect and speeches, the one breed of animal tricks the remaining slowly as they stealthily change rules and create a better farm for themselves. If you’re looking for a story ending in “happily ever after”, this is NOT for you. This novella is twisted and gloomy, showing the bittersweet reality of what happened during Stalin’s reign. Providing incredible connections between the real events and the fictional ones in this story, those who know their history will NOT be disappointed. What’s even more wonderful? You don’t HAVE to know your history to enjoy this novel. You may not know the connections, but this story is still an incredible read. Animal Farm focuses greatly on the overall demise of the communist state on the Animal Farm. Another major focus is how the animals themselves change…dramatically change. For some, the animals grow from independent and strong to weak and passive. As the animals in control grasp more power, the others remain silent and barely lift a paw or claw or hoof to fight for their rights. The ones that do meet a terrible fate, which was the most disturbing section in the story for me. The animals that gain power grow in a dark and twisted way, yet receive the most growth. From walking on four legs and obeying humans, they slowly walk on two legs and become so human like that the rest of the animals can’t distinguish them between the other farmers any longer. Though it’s rather sad, I thought it was absolutely phenomenal that the more “evil” characters received the most growth and gained the most by the end. Sometimes, the heroes DON’T win…a reality we neglect to face at times. The language is probably what sold it for me. The story flows incredibly well as Orwell gracefully slides from one part to the next, providing little hints to things we should be aware of in the later parts of the story. The imagery is divine, pulling readers in as you feel like you’re watching a film. The language is almost poetic, beautifully telling the story of the Animal Farm even though it’s absolutely horrific and monstrous. Animal Farm would also be a great teaching tool, as Orwell is able to perfectly depict the essence of the Stalinist era to those who may have difficulty maintaining the information from a textbook. The novella is so well written, I barely realized I was almost done the story until I was on the second last chapter. Orwell’s Animal Farm is a highly regarded classic, still being used as a teaching tool in schools and for personal leisure. After reading it, I completely understand why this has been given such high praises and a number of literacy awards. It’s rather barbaric but I still thoroughly enjoyed the read. Are you looking for a good “NOT happily ever after” story? Look no further! Give Animal Farm a try. Thanks love! It’s really well done. I could’ve gone on forever about this, but then I remembered that this is a review and not an essay or book report haha! It really demonstrates the concept of societies that deem to be communist yet are more dictatorships, while also reflecting Russia’s history during Stalin’s reign. It’s a hard read but so worth it! Another fantastic classic! I. Love. Animal. Farm. I read it in the eighth grade, and even then – with my limited understanding of the history of the Soviet Union (which was still the Soviet Union, at that time) – I was fascinated. It was hopeless and heart-breaking, and it was my first introduction to the idea that happy endings are not a given. Have you read Ken Follett’s Century Trilogy? Great review! I also never read this book when I was younger, and I only picked it up around last year after LOVING 1984. I still liked 1984 more, but this shows how incredibly clever George Orwell is.